Types of ePayslips - which one are you using? The latest issue of the CIPP magazine Professional in Payroll, Pensions and Reward focused on the ever-present issue of delivering payslips online and featured an article on the different types of epayslips. 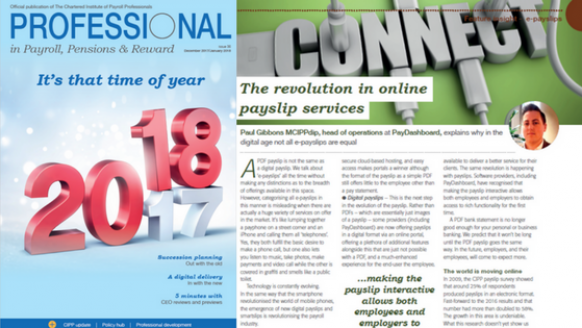 In the December issue of the magazine our very own Paul Gibbons MCIPPdip examined the three main types of ePayslips, and how the delivery of electronic payslips is changing in the wake of new digital innovation and services. We've provided a short summary below, or you can read the full article here if you want to read everything that Paul said... including how he managed to compare an iPhone to a public toilet - all while talking about ePayslips! A more secure solution than email, PDF portals have become more popular with businesses in the last few years. Password protection, secure cloud-based hosting, and easy access makes portals a winner ‒ although the format of the payslip as a simple PDF still offers little to the employee other than a pay statement. The next step in the evolution of the payslip. Rather than flat PDFs (which are essentially just images of a payslip), some providers such as PayDashboard are now offering payslips in a digital format via an online portal, offering a plethora of additional features alongside this that are just not possible with a PDF and offer a much enhanced experience for the end user ‒ the employee. In 2009, the CIPP payslip survey showed that around 25% of respondents produced payslips in an electronic format. Fast-forward to the 2016 results and that number had more than doubled to 58%. The growth in this area is undeniable. What this research doesn’t yet show us is how that 58% was spread across the three categories of electronic payslips above. It would be interesting to start tracking this in order to see not only the move from paper to electronic, but the subsequent shift from electronic to digital. Are you reviewing your payslip delivery options? Contact PayDashboard for a demo of how digital payslips will benefit your business and your employees.